Neven Maguire, Target Lung Cancer Ambassador, shares some of his recipes with us. Preheat the oven to 180°C (350°F/gas mark 4). To make the croutons, cut the crusts off the bread and cut the bread into small cubes. Place in a bowl with the garlic, Parmesan and oil. Season to taste and mix well to combine. Tip out onto a baking dish and cook for 10–12 minutes, tossing once or twice to ensure the croutons cook evenly, until golden brown and crunchy. Set aside until needed. 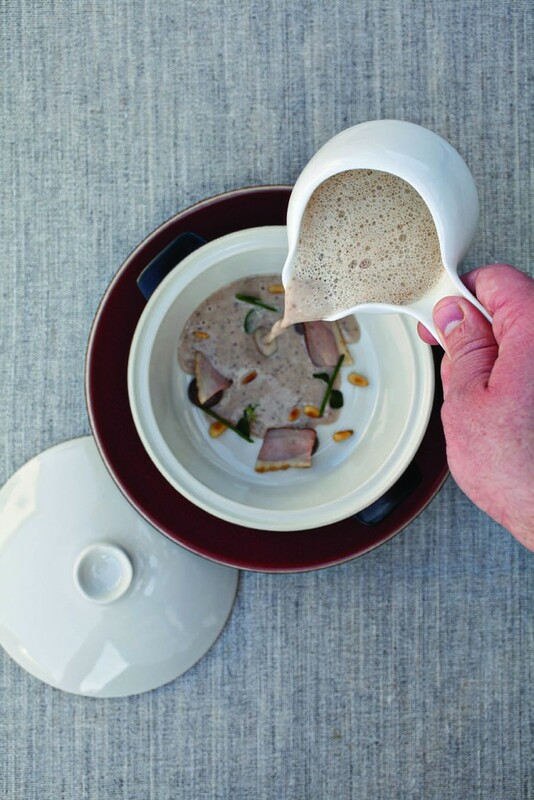 To make the soup, soak the dried ceps in 150ml (¼ pint) of boiling water for 15 minutes. Drain and reserve the soaking liquid. Finely chop the reconstituted mushrooms and set aside. Melt half of the butter in a large pan over a medium heat and gently cook the onion and garlic for 10 minutes, until softened but not coloured. Increase the heat, add the wild mushrooms and stir-fry for 3–4 minutes, until just tender. Pour in the stock and reserved mushroom soaking liquid and add the reconstituted ceps. Bring to the boil, then reduce the heat and simmer for 15–20 minutes, until the mushrooms are tender and the liquid has slightly reduced.